These scents stay with you long after you check out. And you just might find your new favorite on your next hotel stay, such as one of these brands. Here are some of our favorite hotel toiletries we've discovered during our travels. When you stay in high end hotels and resorts, you come to expect high end toiletries. But not all hotel toiletries are created equal. Here are some of our personal favorite hotel toiletries. New York City based Le Labo is a dominant force in the luxury hotel toiletry scene, with signature scents and personalized labels. We love Fairmont Hotels and Resorts. And Fairmont Hotels and Resorts’ use rose-scented Le Labo products. While the scent is a bit feminine, we still love Rose 31 Le Labo products and look forward to them when we stay at our favorite Fairmont property, the Fairmont Pacific Rim. The Park Hyatt New York has their own collaboration with the brand, which created the Tubereuse 40 – a woody/floral scent – exclusively for the hotel. Park Hyatt St. Kitts uses the brand’s Santal 33 amenities, which we are excited to try out later this week. And Marriott's EDITION hotels (read our Miami Beach EDITION Hotel review) have their own custom Le Labo scent that’s reminiscent of Noir 29 – a scent made with fig, bay leaves, bergamot, cedar wood, black tea leaves, vetiver, and musk. In terms of masculine smells, it's probably our favorite Le Labo scent. London-based Asprey, a luxury goods company dating back to 1781, has a partnership with The Ritz-Carlton. Guests of the brand’s properties around the world enjoy Asprey’s Purple Water Collection, a fresh citrus fragrance with spicy notes. 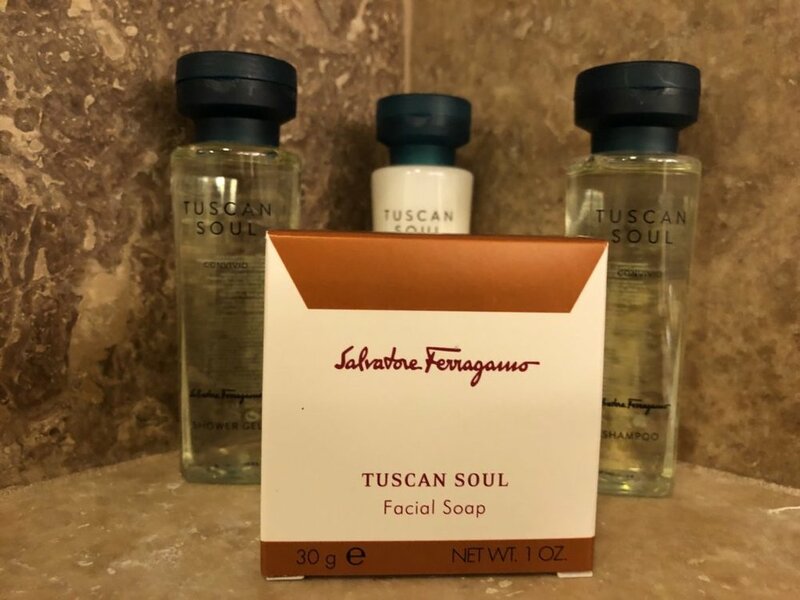 Famed fashion designer Salvatore Ferragamo entered the world of high-end toiletries after forming a partnership with the Waldorf Astoria Hotels and Resorts. The company’s Tuscan Soul line of bath products greet guests from the marble shelves of the hotels’ posh bathrooms. And we are a big fan of the Ferragamo toiletries. They smell fresh and light, but aren’t overly floral. Loews Hotels feature toiletries by celebrity hairstylist Julien Farel, whose past clients have included stars such as Kate Moss, Richard Gere, and Giuliana Rancic. Loews Hotels and Julien Farel describe the toiletries as a custom assortment of Julien Farel Anti-Aging Haircare and Body Products. And they feature clinically proven Anti-Aging Bioactives, such as Hyaluronic Acid. Plus they work to intensely hydrate and protect the skin, scalp and hair. And we always look forward to using them when staying at Loews Hotels like our recent stay at Loews Hotel 1000. At Conrad Hotels & Resorts, you'll actually get your choice of three different brands of toiletries including Shanghai Tang, Temple Spa and The Refinery (by Aromatherapy Associates London). We are big fans of Aromatherapy Associates London and we really enjoy The Refinery Line. The Refinery, inspired by the renowned men's grooming salon in London, is blended with the latest cutting-edge ingredients and essential oils to care for pre and post shave skin. Designed for any age, skin is soothed, calmed and protected. And finally, Andaz Hotels & Resorts features the Pasadena-based organic skincare line Lather in their rooms. 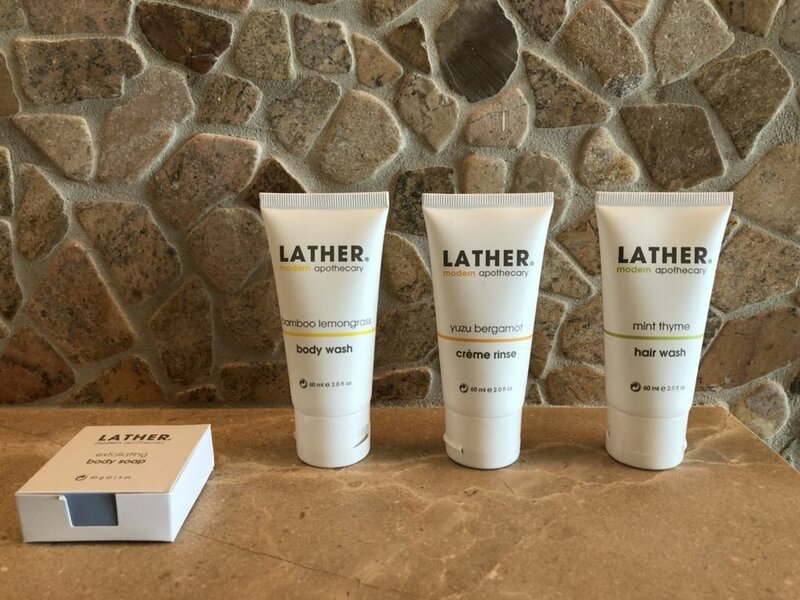 The Lather bath and body products (including bamboo-lemongrass body wash, mint-thyme shampoo, and yuzu-bergamot conditioner) smelled fantastic. And they are definitely one of our favorites. 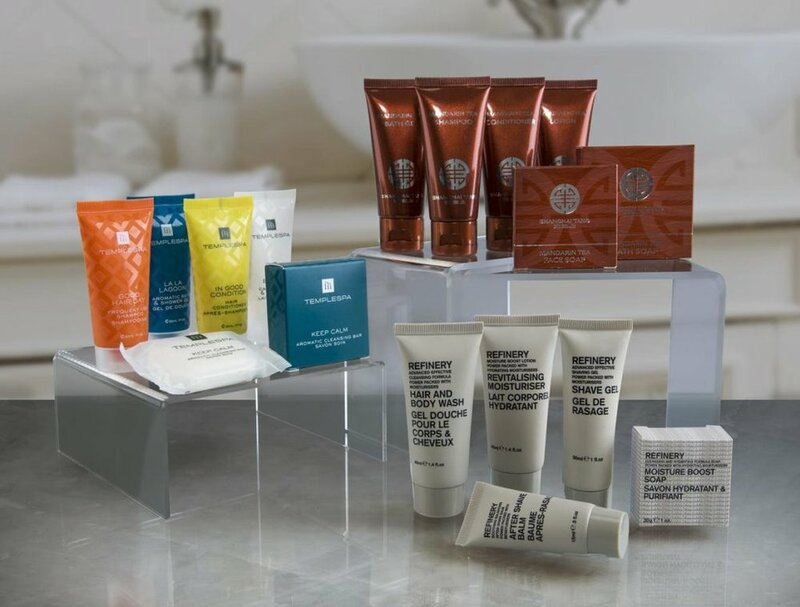 What are your favorite hotel toiletries? Comment and let us know!